I thought of Isaac Stern yesterday throughout a concert at the Kansas City Symphony conducted by Michael Stern, Isaac’s son. Although we have season tickets to the Pops Series of the Symphony, and we go to other concerts as well, we have never actually been to a concert that Michael Stern conducted. As I watched him conducting, putting his entire body into the music, I flashed back to that moment about 40 years ago when I saw his father. Since that time when I was in graduate school, I have been to many concerts. I have attended concerts throughout the USA including the Aspen Music Festival, Boston Pops, Kansas City Symphony. I have been to La Scala, in Milan, where our hosts arranged for my son, my husband, and I to go behind the scenes at the music school [Accademia d’Arti e Mestieri dello Spettacolo (Academy for the Performing Arts]and see the incredible instruments and tour the school. I still cannot believe we got to do that! Although I took piano lessons for many years, I was never the most talented musician. (See link below.) Those years of lessons, however, taught me to love music. I love to listen to the sounds of a symphony. I have sat in other venues and listened with my ears and my heart to other wonderful concerts and extremely talented musicians: including violinists Itzhak Perlman, Midori, and Pinchas Zukerman; and cellist Yo Yo Ma. I have seen Zubin Mehta conduct. Not one of them have ever compared to Isaac Stern for me. Perhaps it was because it was my first time to see such an extraordinary musician. However, I think it was because of the way he lived and breathed his music. I will never forget him on his tiptoes, playing his violin and reaching to heaven with his music. For me it is true, as this quote attributed to Plato says, “Music gives a soul to the universe, wings to the mind, flight to the imagination and life to everything.” For me, it was Isaac Stern who first truly gave me this gift. Seeing Isaac Stern in concert touched my heart. On November 7, 1981, my cousin made a cassette tape of my grandfather singing his favorite songs in Yiddish. It sat in my house for all these years. I could never listen to it after he passed away. Grandpa had a wonderful singing voice and used to sing to us all the time in Yiddish. Two months ago, I took the cassette tape to a company that turned it into a CD. I got it back on Friday. On Mothers’ Day, I listened to my Grandpa sing in Yiddish and listened to him speak about his life in Europe and coming to the United States in 1920. He passed away in 1989, so it has been a long time since I heard his voice. It was just as I remembered it. Listening to this tape was interesting in many ways. Most of the stories he told, I have heard before. I had spoken to my Grandpa about his life in Europe many times. I just never recorded him. I am extremely grateful that my cousin made this tape. He sang six songs. Tumbaliaka, Hativah in Yiddish, Ofin Primpinchick, Yiddisha Mama and two others I had not heard before. He left out some I remember him singing. But it doesn’t matter. Hearing him sing these favorites is a gift. When he first arrived in the USA, he lived with his uncle Morris and went to work as a butcher. A farm boy, he knew about animals. He worked for $4 a week. He did not know English. It was a job he did not like. A month later, he switched to being a baker for $20 a week on Flushing Avenue in Brooklyn. (I never knew the address in Brooklyn. ) He was lucky. He had relatives who were both a butcher and a baker. And they provided him with jobs. Grandpa was brought up to follow the rules of Shabbat, although they were not extremely religious. He had no beard or payos. But when he first started working at the bakery, he had to light a fire on Shabbat. “I sat there and cried,” he said, “because my Mother always told me that if I light a fire on Shabbat I would die.” He did not die, so the following week he lit the fire without crying. Grandpa excelled at baking. But he said he was very bashful. People would say to him, “Do you want to meet a girl,” and he would say yes. But they did not work out. Then, by accident, he met our Grandma in Brooklyn. He went to deliver a gift to someone, and there she was. They got married in September 1925 and lived in Brooklyn, till my uncle was born. Then Grandpa opened his own business in the Bronx, where they lived for five years. And my Mom was born. In 1929, they moved to Linden, New Jersey. My grandparents opened a new bakery. But they had it for only about 18 months. When Grandma came back, they moved to West New York, New Jersey, and opened the bakery they would have for almost 30 years. He told us a bit about his younger siblings and his parents. But the main discussion was the fact that none of them survived. “I could not convince them to come,” he said. As for his wife’s parents, my other great grandparents, Grandpa said, “From the day I got married I had to support her family.” Which is true. Her mother had died during WW1. And her father, was an educated man. He studied. “His wife made a living for him,” my Grandpa said. When she died, there was not much income. The tape was made just over three months after my grandmother died. It was strange to hear Grandpa say her name. He never said it when she was alive, to keep the evil eye from getting her. He was still in deep mourning. They had always thought he would die first as he was six years older. But instead she died. My cousin asks questions. Some Grandpa answers. But he made his point. He loves his family. “I accomplished my mission. I would have my own home. And I did more than that,” he said. He got to see four of his five grandchildren marry. He saw the arrival of six of his eight great grandchildren. Before he ended the tape, he sang one last song. He sang of traveling the world, always wishing he could go home and kiss the stones where he was born. My cousin asked if he would want to go back to Austria. Hearing my Grandpa talk about his family; his children, and his grandchildren was bittersweet. I made CDs for my siblings and cousins. I think they need to have this experience as well. Why do I know so many Broadway melodies? I could say it was because I was raised in New Jersey, giving me the opportunity to see shows. But I have to be more specific I think. We have the fortunate luck of having an Uncle who was involved with the Broadway theaters. It made it much easier for us to get tickets in the time before on-line purchases. I am sure my parents got our show tickets from him, as we went as a family to see “Fiddler,” “Man of La Mancha,” The Rothschilds,” “Pippin,” among other shows. My Dad loved going to shows. And thanks to my Uncle, we often had house seats. In fact, it never occurred to me as a child that you did not sit in house seats. These were seats reserved in the front center. My Uncle could get us the best seats. And if we were not in the center, we were always in the Orchestra section. I remember the awe of watching the actors and actresses on stage, listening to the live music and hearing the lovely voices. It was magic. I still get that feeling when I see a play. My Uncle also provided all of his nieces and nephews, as well as his own children, tickets for a Broadway show each Hanukkah. That was truly wonderful. We almost always had the best seats. Except one time, when we were in the top balcony. I remember as we kept walking up and up and up, I turned to my cousin and complained, “What happened?” We found out later that our grandmother did not want us too close to the stage….It was “Hair” and the actors disrobed. Maybe she thought we would race to the stage. My original Playbill from Hair as well as the flyer I picked up at the theater. This memory came back to me on Saturday night when the musicians ended their performance with a rousing rendition of “Aquarius” and “Let the Sun Shine.” I was moved back in time. It was December 1971. I was 16, a junior in high school, and I was in the Biltmore Theater seeing “HAIR!” “Aquarius” was my lucky song growing up. I was born under this astrological sign. So I believed whenever this song played, something good was about to happen. And yes, something I was hoping for did occur the next day. When I met my husband, he had never been to a Broadway show. Makes sense, he was born and raised in the Midwest. But the first time he came East, when we were engaged, I changed his world. I called my Uncle and asked if he could get us seats for “They’re Playing Our Song,” with Lucie Arnez and Robert Klein, at the Imperial Theater. It was the hottest show. My Uncle did it. I took Jay. But for the first time, I actually paid for the house seats. Ouch!!! But it was worth every penny! My husband loved it as well. I am glad he caught the ‘bug.’ I love shows. We have season tickets for three different production companies. I used to have four, but gave up a summer series this year after 32 years, as we travel too much in the summers. There are many shows I have seen a number of times. But I don’t care. Most shows I don’t mind seeing several times. There are just a few I am done with seeing. And only two that I never want to see again. I still try to see a show on Broadway at least once a year! Seeing a show takes you away from the world for a few hours. Just like a book, it moves you across time and location into someone else’s world. I thank my parents and my Uncle for giving me the gift of musicals and drama. I was glad that my husband and I passed this gift on to our children. The memory of sitting in House Seats with be with me forever. Listening to an expert on the steel drum. He was amazing. Yesterday in St Maarten we decided to go on a different type of tourist adventure. We have been on this island several times and had no desire to tour around the island or go shopping. But we did find the perfect experience. 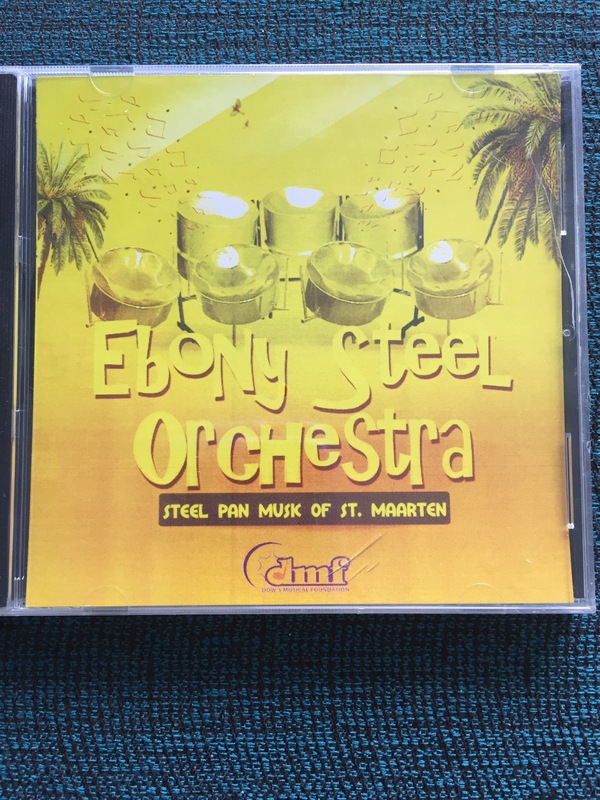 We learned to play steel pan drums. A tour from our cruise ship went to the school run by Dow’s Musical Foundation. 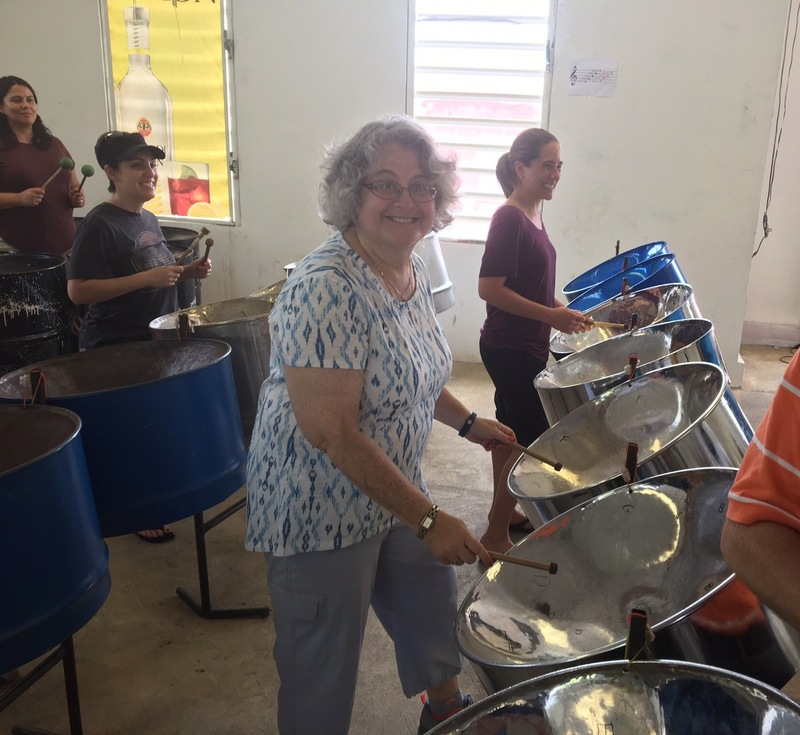 There we experienced the Caribbean music of the steel pan drums and practiced with a group to actually play a song on the drums. Who knew there were several types of drums? Well there are: tenor, bass and one in between. Some are for the melody, others to hold the beat. Most of the drums comes in sets of two. There are two octaves, but the notes are devided between the two drums. Except for the base. Those playing the base had to play on five different and much bigger drums. 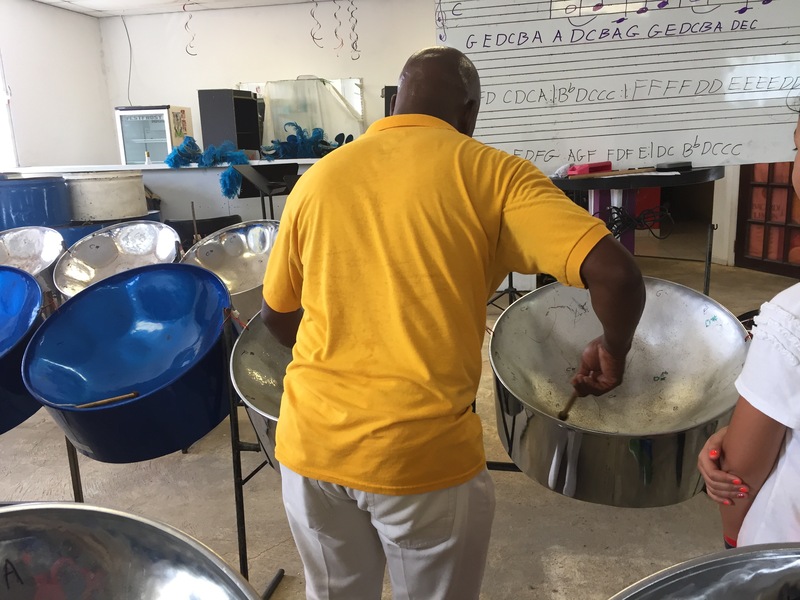 A magical moment playing the steel pan drums! At first I was a little slow. But eventually I got into the beat with the help of one of the teachers (who is from Kentucky!). Going back and forth between the two drums was a bit confusing at first, but soon my brain caught up and my hands used the drum sticks. It was sort of like playing the hammered dulcimer. A gentle snap of the hand to get the best sound! But the highlights was a short performance by one of the school’s founders. His passion for the music, his sense of rhythm and his joy were contagious and amazing. We then had the opportunity to listen to a group of school children as they preformed a song. These were students from one of the schools who take music lessons there. Over 1100 students have the opportunity to learn music. To support the foundation, we purchased a cd adding a liitle extra. It was worth it to see the smiles on the children’s faces as they focused on their playing, on their instructors and us. I am so glad we took the opportunity to do something different and put a little musical magic in our lives! As the oldest granddaughter, my grandmother made it clear that I would inherit my grandparents’ cherry mahogany bedroom set. The most important pieces of furniture that came with it were my grandmother’s vanity and the small chair that goes with it. The swivel chair is covered in a gold silk fabric. It is now a bit tattered, but I will not change it. In this chair my grandmother held me at night and sang Yiddish songs to me before I went to sleep. She usually sang “Oif’n Pripetshik,” a song about children learning in their alef beiss, the alphabet. Even now, over 50 years later, listening to this song calms me. I feel my grandma’s arms around me; I smelled her scent; I feel the softness of her hair and her breath in my ear as she sings and slowly spins in the chair. My grandparents kept the traditions they grew up with in Europe: Two twin beds, always. Grandpa would get up very early in the morning to go to their bakery and make the fresh bread and pastries. Their apartment was on the top floor of the building that housed their bakery in West New York, New Jersey, right on Palisades Avenue. Grandma would stay in bed with me a bit longer. Before she left she always whispered, “Remember, when you get up, get dressed and come down to the bakery.” Then a soft “Geh shluffen.” And she would be gone as well. Sometimes we would sit with him and sing together. Other times we would just listen. Occasionally, at a synagogue dinner in the Catskills, he would sing his Yiddish songs for the congregation. I remember once for my parent’s anniversary he sang several songs. But my Mom got very upset when he say, “Wus Geven is Geven un Nitu.” I honestly do not think he meant to hurt her feelings. He just loved to sing that song. My grandparents had a beautiful carved walnut baby grand piano. The keys made of ebony and ivory. It was my Mom’s piano. She studied as a special student at Julliard when she was in high school. And even though she loved to play the piano, she went to college to learn to be a teacher instead of continuing at Julliard. My grandparents felt teaching was a much better professional for a young woman in 1947. I also learned music on this piano: years of lessons. I was never as good as my mother. But I did learn to love it. My teacher was kind. He let me chose the songs I wanted to learn. It was obvious that I would never be a concert pianist. When I married, the piano and the bedroom set moved to my home. When I was pregnant with my daughter I would play the piano every day. I often played from a book of Yiddish music: “Jewish Nostalgia For Piano/Guitar/Organ/Accordian” published by the J & J Kammen Music Co. Sometimes I could feel my daughter kick within me as I played her favorite songs. I know that she heard the music! After she was born, when she was fussy, I would bring her into the music room and play “Oif’n Pripetshik” for her. Within minutes she would be calm listening to the music. My grandfather, Papa, lived until she was 3 ½. He would sing to her in Yiddish as well. She does not remember much about him. But he would hold her close to his face while he sang. What she remembers is that “Papa had a scratchy face.” He did not shave as often when he was in his late 80s. When she was old enough, my daughter also took her first piano lessons on our family’s baby grand piano. Like me, she was not meant to be a concert pianist. But we both learned to love and read music while learning to play piano. I would often play music for my children when they were little. I often would play the Yiddish music of my childhood. Over the years, many people have come to visit and would play the piano. One childhood friend came to visit several years ago. She asked what happened to my Mom’s piano. I took her into my living room to see it. She cried as she stood in front of it. There was so much love invested in my piano. I am so fortunate. I have a chair to sit in to remember when my grandmother sang to me; a piano to play the music that my grandparents taught me. I have the Yiddish songs that I continue to hear in my mind and sometimes still play on my piano. Amazing memories and sounds of Yiddish songs from just looking at a chair and a piano. I went to my first concert at Drew University to hear Harry Chapin. I had been to musicals on Broadway, opera performances at the Met, and symphony concerts. I had even been in Central Park in 1973 when Carole King gave a free concert. I along with tens of thousands of people packed the park. I really did not see her, but I remember the sights and the sounds. And of course, I was close to Woodstock in 1969 since it was held just a mile and a half from our summer home. With the acoustics and the hundreds of thousands of people, Woodstock actually came to me. I could feel the ground shake and the music rock from my bungalow. It really was a memorable experience. But I had never ever been to a ‘rock’ concert before, where I actually could see the performer up close. The Harry Chapin concert at Drew was my first such experience. I have never forgotten his concert, even though I have been to many concerts since then and have seen performances by many musicians. I do not know how, but I was able to sit near the front of the room with my friends. I don’t know how we squeezed so far forward. Did we have tickets with seat assignments? Who remembers ? All I know is that we had great seats! If we actually sat. I sort of remember standing most of the time. I do know that Harry Chapin touched my soul that night. He sang, “Cat’s in the Cradle,” among many other songs. But it was this song that has stayed with me throughout my life. Listening to him sing that song made me happy and thankful that my Dad always paid attention to us. My Dad always found time to be with us and give us attention. At the end of the song when the son does not have time for his father, I teared up. Even though I was not quite 20, I already felt his angst of not connecting. Although the words of that song made me sad, I loved Harry Chapin’s voice and I loved the story lyrics of his ballads. I became a forever Harry Chapin fan. I owned his records, and then when records (or vinyls) became obsolete, I purchased his songs on CD and ripped them onto my computer and cell phone. When I had my own children, I took to my heart the lyrics of “Cat’s in the Cradle.” I always made sure that my husband and I had time with our children. My husband, as a physician, was busy. But he always had time to be in charge of bath time and to read bedtime stories to our children. It was a tradition that he hated missing when he was out of town. And our children hated when he was gone. My bedtime reading was never good enough because Dad made every character special with a different voice. When he read the Harry Potter books…. All the Harry Potter books… we would all sit in the bedroom to listen to him read. Yes, he even read to us when our children could read the books by themselves. Our daughter would zoom through the books by herself, but still come in to hear my husband read. He always stopped after one or two chapters and we would beg for more. “Just a little bit more, please.” Sometimes he would give in and read a bit more. But it really was never enough. He was and is a great Dad. So when my children say, “I’m gonna be like him,” I know that they mean they will be good parents who spend time with their children. Not distant parents who missed the best times of their children’s lives. In the past year I have been to three concerts by some of my favorite ‘oldies’: James Taylor, Neil Diamond, Diana Ross. All of them have songs that I love. And have meaning for me. James Taylor’s “You’ve Got a Friend,” reminds me of the summer I was 16. Diana Ross has many songs I love. And Neil Diamond’s songs make me want to dance. It is a different feeling when I go to see these concerts. Yes for Diana Ross, we were all on our feet almost the entire concert singing and dancing along. I enjoyed the crowds singing along with Neil Diamond at the Sprint Center in Kansas City and at the wonderful concert at the Starlight Theater to listen to James Taylor. But nothing compares to that first concert at Drew. The excitement I felt walking from the dorms; the anticipation of being with so many people listening to a favorite singer; the joy of being there and seeing him in person: it was fantastic. I am thankful that in my world family came first.